I had been looking forward to madeleines since the beginning of school, because it was the first dessert on the list that I actually really like. Although I had made them once before, I heard that the Cordon Bleu recipe makes unrivalled, amazing, light, fluffy tea cakes. We had the young, strict chef for demonstration, and he shared lots of interesting information about madeleines. First of all, did you know we’ve been displaying them wrong in North America? The un-scalloped side should rise with a “head”, and since that’s the head, it is the right side up. 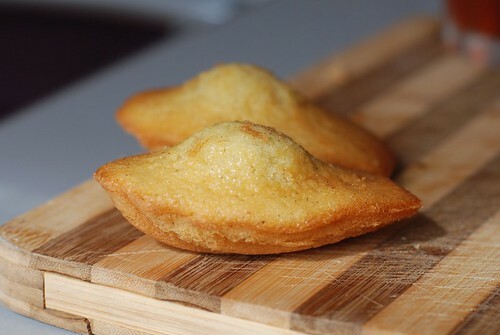 The reason why the madeleines have a scalloped side is because the first time they were made, they were made in leftover shells from another dish, Coquille St-Jacques! If any bakery in France displays the scalloped side, you should be suspect that the cakes didn’t rise well, and that’s why they had to resort to showing the back. I really enjoy the classes taught by this chef. I admit he’s easy on the eyes – there are simply girls fawning over him in my class (really awkward when they giggle around him). That’s not why I like him, though. He is incredibly organized when he is teaching, which makes note-taking a lot less stressful. He is also super knowledgeable about the genealogy of foods, and the “know-how” behind the things we do. 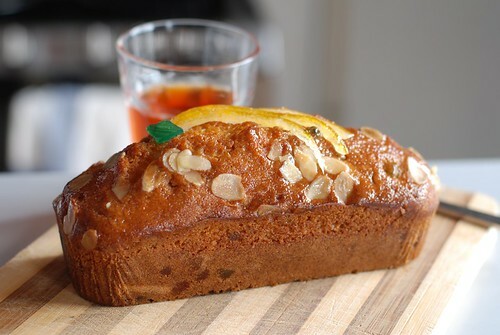 For example, he explained why we add lemon zest at the end, how citrus and milk will cancel each other out and keep the pH balance in the batter, how lactic acids and baking powder develop and react during the resting period…etc. These are things that I would never have learned toying around in my own kitchen, and that’s why I am here today. I love learning about why baking is such a science, and this chef is amazing for that. He does it all while teaching us how to make the recipes, and somehow his classes still flow smoothly and I never feel overwhelmed. The other part of the class was on lemon pound cake, and fruit cake. This class was on the cakes that can be transported because they can be kept at room temperature. Working the batter to the right point so that they all rise beautifully was also something they shared in common. I can’t say I loved the fruit cake, but at least there weren’t any offensively-neon-coloured fruits to be integrated into the batter. When we got to try the samples at the end of the demonstration, my friend and I were just starry-eyed, completely in love with the madeleines. They are just slightly caramelised/crispy on the outside, with the softest, pillowy cake in the middle. A hint of lemon makes them absolutely perfect. With this delicious treat in mind, it was very easy for me to be motivated and excited about the practical class later that afternoon. 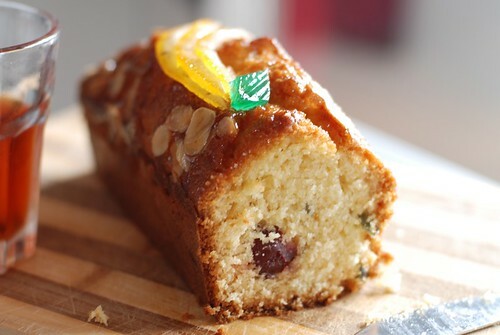 The fruit cake from class – we ended up tasting some, and tossing the rest. The practical class was really relaxed. Since my notes were well-organized, I felt more confident walking into the classroom, but of course, we had a different, easygoing chef who didn’t make me nervous. I wish we had the young chef so I could have had a chance to redeem myself after all the nervous wreckage last time with the apple tarts. My madeleines came out pretty, but they didn’t rise as high as a couple of other people’s madeleines. I think my batter didn’t rest long enough, and also got a bit too warm before going into the oven. Since I finished filling my mold first, my madeleines sat waiting by the oven for a good few minutes before they actually went in. Oh well. They still tasted delicious, but if I were to make these again at home, I would definitely give them a good amount of resting time before baking! 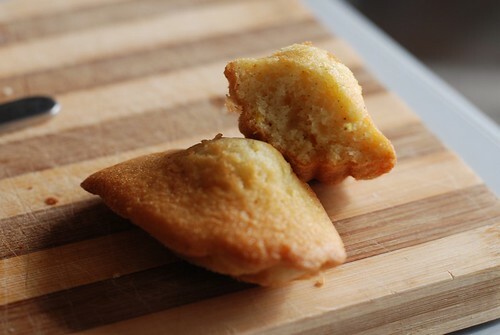 Inside the fluffy little madeleines. I can’t remember if I have a good madeleine mold at home, but I will be scouring Paris for a good one to bring back with me. They’re the quintessential Parisian afternoon tea companion, and I look forward to making them often!